The book Small Giants resonated with me in a way few business books ever have. 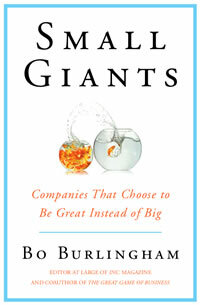 Author Bo Burlingham defines small giants as “companies that choose to be great instead of big”, an idea near and dear to my heart. As a young designer in Chicago, my employers and clients were small companies. At the time I wasn’t aware how special those early experiences and relationships were. The work seemed, frankly, boring and limiting. I was antsy to move on to bigger agencies and brands. After the agency collapsed, I struck out on my own. Eager to get back to “good clients”, I thought about what my favorites had in common. Here’s what I knew: They sold something of tangible value, and they did it honestly. They were fair to suppliers and partners. They were small and closely held, often family-owned. They treated employees with respect and generosity. They were local businesses — what defined that wasn’t clear, but I knew it when I saw it — and they supported community service and philanthropy. In short, the world was better with than without them. This led me to a loose concept of social responsibility: doing business with integrity, giving back to the community, and treating people well. It also seemed being privately held was the key to being able to control everything else. Those became my four criteria for choosing clients ten years ago. Finding Small Giants was inspiring and validating. Finally, a cogent description of what I’d intuitively understood but been unable to define! An entire book about the business unicorns I love! I now have a clearer sense of who the right clients for me are, and new insights into what to look for. One idea that hadn’t previously gelled as part of my definition was limited growth — choosing to grow only when it serves strategic goals and doesn’t sacrifice culture or ideals. Growth has become such an unquestioned requirement of business that not growing is surprisingly radical. Another insight was that “small” isn’t necessarily what makes my clients a good fit for me. It’s having a family culture, engaged leadership, and sense of purpose where I thrive. While it’s certainly easier to maintain those in a small company, there may be mid-sized companies that also fit this bill. I also love the inclusion of soul, or mojo, that Burlingham cites as a secret ingredient. Running counter to management playbooks and belief in predictive data, it acknowledges there is a special magic that allows a company to be intimately, deeply great. That I couldn’t concretely define what I loved about my clients makes sense — there is simply a quality. They either have it or they don’t, and no logic model can predict it. Finding small giants is no easy feat. But with renewed inspiration and clarity, I look forward to seeking more of them as clients and also to doing my part to help aspiring small giants find their mojo. Your story of your experience is wonderful, Erica. I’m glad that Small Giants helped to validate it. I think that’s been the case with many people who’ve read it. They already knew it in their hearts. They just didn’t have a name for it. Thanks, Bo, for visiting and responding! Most of my friends and colleagues have never been part of a for-profit company they truly believe in. I’m grateful to the book for verifying soulful companies, while rare, do exist and setting a standard to strive for.